Un Homme et une Femme/Those Were the Days from Mark Nuckols on Vimeo. Slovak drinking song about the perils of service in the Austr0-Hungarian army. Vinko My Dear Red Wine from Mark Nuckols on Vimeo. Mám ja hrušku - "I have a pear"
I have a pear (feminine gender in Slovak), what after her? I have a nut (masculine), what after him? I had a girlfriend, she doesn't want me any more. No so much, just a little, so that nothing happens to her, my little dove. Hruska, Pear--Slovak folk song--performed by Galloping Gypsy from Mark Nuckols on Vimeo. That "Austrian" song by Rogers & Hammerstein. As performed by Julie Andrews, Christopher Plumber & Lady Gaga! Edelweiss - Mark Nuckols from Mark Nuckols on Vimeo. Performed Aug. 29, 2014 at The BANK Coffee House in historical Onancock, VA.
One More Wine/Ešte si ja... Slovak Drinking Song from Mark Nuckols on Vimeo. 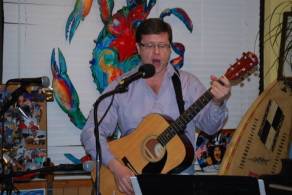 From my headliner performance at The Great Machipongo Clam Shack, July 1, 2015. "Girls Are the Thing," also known in Hungarian as "Jaj Cica," from the Emmerich Kálmán operetta The Gipsy Princess, a.k.a. The Czardas Princess, a.k.a. Die Csárdásfürstin. Czardas Princess - Girls Are the Thing from Mark Nuckols on Vimeo. July 1, 2015. Headlining at the Great Machipongo Clam Shack, Nassawadox, VA. First two songs of the performance: O Poštaris ("Oh, Postman"), Gypsy song from Slovakia; Milaya ("My Dear"), Russian Gypsy song. Thanks to Peg Volk for inviting me to headline, to Bob Sellers for operating the camera. Galloping Gypsy Clamshack Headliner Postaris Milaya from Mark Nuckols on Vimeo. Chevaliers de la Table Ronde, French Drinking Song from Mark Nuckols on Vimeo. One of my favorite works of all times, "Gypsy Airs" by Pablo Sarasate. Although the composer was Spanish, he drew inspiration for this piece from the Hungarian Gypsy tradition (I always picture the Great Hungarian Plain when I hear it). Sarasate was primarily a violin virtuoso, and his compositions for that instrument are often showy and extremely difficult technically. Zigeunerweisen employs nearly every technique imaginable and puts all the richness of expression of the violin on display. And it is emotionally very engaging. Katy Vimeo 2014.06.06 from Mark Nuckols on Vimeo. Petar Preradović Square - while not the main thoroughfare (that's the Dolac) - is the artsiest place to hang out in the cafes. Be sure and check out Matej's YouTube page. While you're at it, go to my performer page--and like it if you haven't already! MVI 1317 from Mark Nuckols on Vimeo. In keeping with the theme of my "World of Yesterday--Today" tour, I'm showing this clip of Zagreb's pride in it's Austro-Hungarian heritage. Aljoša Jurinić, one of the "Young Croatian Stars" in last night's (7 July 2014) performance in the atrium of the Galerija Klovićevi dvori in Zagreb's Upper Town. Here, he's playing Liszt's Hungarian Rhapsody No. 11 in A Minor (around 1840) - Lento a capriccio - quasi cimbalo. "Quasi cimbalo" - "Like the cimbalom" - means the pianist must imitate the Hungarian/Central European instrument to give the impression of Gypsy music, which requires highly developed technique. (Apologies for the motor noise--next time I'll avoid zooming in and out.) To see the full piece, see Balint Vazsony's interpretation here. Liszt's most well known Hungarian Rhapsody is no. 2, but this one is intriguing to me, having heard hundreds of hours of cimbalom music in my travels in Central Europe. Liszt in Zagreb (appropriately Austro-Hungarian) from Mark Nuckols on Vimeo. As part of the commemorations of the assassination that ignited WWI, Šaban Šaulić, arguably the most famous of contemporary Serbian folk singers, performs his "Verujem u ljubav" or "I believe in love" from Sarajevo's Latin Bridge (near the spot of the shooting) shortly after midnight 28 June. For the full song, please click here. Šaban Šaulić, Serbian folk singer, on Sarajevo's Latin Bridge, 28 June 2014 from Mark Nuckols on Vimeo. My thanks also to Kieran, the Australian who agreed to take the camera--and is not at all to blame for the fact that the camera quit as I was going into the English verse. If you enjoy this, please visit my fan page https://www.facebook.com/GallopingGypsy. Thanks! MVI 1236 from Mark Nuckols on Vimeo. O poštaris - Romani/Slovak "Mr. Postman" from Mark Nuckols on Vimeo. Here's another from last month's First Wednesday at the Great Machipongo Clam Shack. A tune I learned from Roma friends in Slovakia two decades ago, I also had to opportunity to lead other Slovak friends in singing it at last weekend's goulash party--sorry, no recording of that one here, but please see my blog for other music from that event. The Polish Birthday Song - "(May You Live) A Hundred Years"
I learned this old favorite, well known to Slavs of various nationalities, while living in Slovakia. In this video I'm singing it for Jeff, Rita (a Ukrainian) and Poet Cin at the Great Machipongo Clam Shack's most recent First Wednesday open mike night, June 4. I sang it the month before, having overheard that someone was celebrating a birthday, and another lady stood and said it was her birthday--and that she was Polish! And just passing through town (the tiny town of Nassawadox for my non-Eastern Shore viewers). Ah, serendipity in travel, my specialty, namely when it involves music. Sto lat - the Polish Birthday Song from Mark Nuckols on Vimeo. In addition to Gypsy music and East European material, it will expand into other genres, geographical spaces and time periods, namely through linking to other artists, videos and sites of interest. Here's another Russian Gypsy song. I can't decide if I'm more bewitched by the music or the performer, Svetlana Yankovskaya. The title is "Sing, ring out, my guitar."